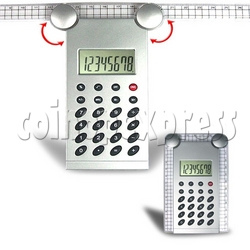 8 Digital Mini Desk Calculator is an indispensable tool for students, households, and offices for quick math calculations, figuring finances, converting cooking measurements, or anything else you can think of when you wish you had a calculator at hand. It comes with modern design with wearable key, its digital was protected under plastic surface of the key and powered by L1131 battery. Independent memory assures consistent reckoning. The 8 Digital Mini Desk Calculator has several special functions keys, including markup and markdown, square root, constants for +, -, x, and /, and 00, grand total, and a one-touch percentage key. With three-digit comma markers, it's easier to read longer numbers at a glance. The oversize, readable 8-digit LCD8 8 provides more information for more complex computations.